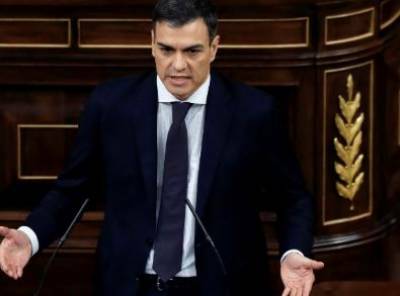 Madrid (Web Desk): Pedro Sanchez was sworn in as new prime minister of Spain on Saturday, 24 hours after Mariano Rajoy was defeated in a no-confidence motion in the Spanish Congress. Sanchez was sworn in by King Felipe VI at the royal residence at the Palacio de a Zarzuela on Saturday morning. The leader of the Spanish Socialist Party (PSOE) automatically became Rajoy’s replacement as prime minister after presenting the motion which led to Rajoy and his right-wing People’s Party (PP) losing power in the wake of the result of the “Gurtel” corruption trial on May 24, in which the PP was found guilty of having benefited economically from wide-scale cash-for-favors scandal. It is the first time a Spanish prime minister has come to power as the result of a no-confidence vote, with Rajoy obtaining 169 votes against the motion, and 180 in favour and one abstention. Sanchez becomes the prime minister with a weak government given that the PSOE currently holds just 85 seats in the 350-member Spanish Congress.